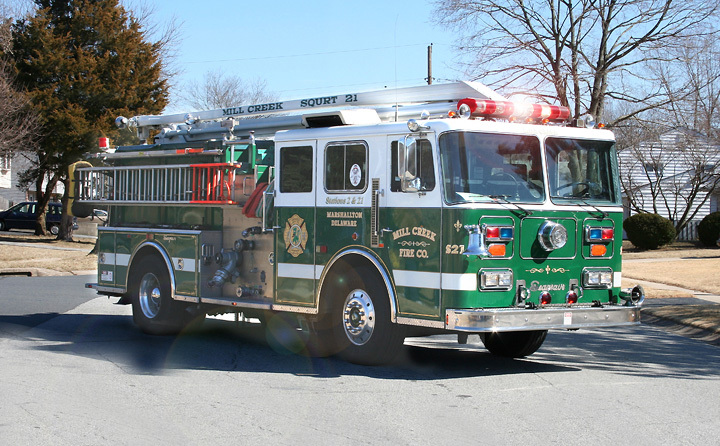 Painted in Miil Creek "green," Squirt 21 is a 1989 Seagrave 1500 gpm pumper with a 750 gallon water tank. It serves as the department's mutual-aid engine, responding on calls in neighborhing fire districts. Since 1927 the department's apparatus have carried the green color, adding white over cabs in the 1970's and the safety stripe in the 1990's. they have a old mill creek engine based near glasgow i saw it on ebay its owned by the crazy fire company. Added by Michael Jones on 26 February 2009. The Mill Creek fire engine can be seen sitting in a field next to the A736 Barrhead to Irvine just outside Lugton. Added by TOMMY SWINDLE on 27 February 2009. It is now "Wagon 20", in red and white paint, used for city tours of nearby Glasgow, Scotland. Decommissioned from Mill Creek FD, Pennsylvania in March, 2006. It is Raised Roof Pumper - ? Seagrave ? Long way from home; and in strange colours. Added by Pat Rivers-Bowerman on 28 February 2009.